Before spending a penny on reusable nappies it’s a good idea to see what types, styles and brands of nappies work best for your child. 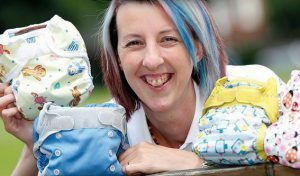 Leicestershire residents (excluding Leicester City) are entitled to borrow a reusable nappy trial kit free of charge for 4 weeks. Our kits contain a selection of different reusable nappies which are suitable to try at any point from birth right up to potty training. Borrowing one of our kits is simple, and you’ll be assisted by a Reusable Nappy Advisor who will help you to make the most of your trial period. “It was a great help to be able to try out different types of reusable nappies as there are so many to choose from and I didn’t know where to start”. You can also watch various reusable nappy video demonstrations by clicking here. Volunteer Real Nappy Advisors distribute free and impartial advice to parents interested in reusable nappies for their children. No experience is necessary to become a volunteer Real Nappy Advisor as full training is available. It’s a great opportunity to help other people to save money and do something good for the environment. Check our What’s on page for upcoming opportunities to meet reusable nappy advisors and other parents using (or considering using) reusable nappies. See what other parents are saying about our loan kits on netmums.com too. Just click on the box to the right. If you then go on to use reusable nappies on your child after the trial, your advisor will continue to offer you support. Using reusable nappies is a great choice. From birth to completion of potty training, each child is likely to require 5,000 to 6,000 nappy changes*. One set of reusable nappies can see a child through that entire period. That same set could then be handed down to a younger sibling, or could be sold on for use by another child. Because of this, reusable nappies are cheaper in the long term than using disposable nappies, and they are much better for the environment too. The average child will need 5,000 to 6,000 nappy changes before potty training is complete.